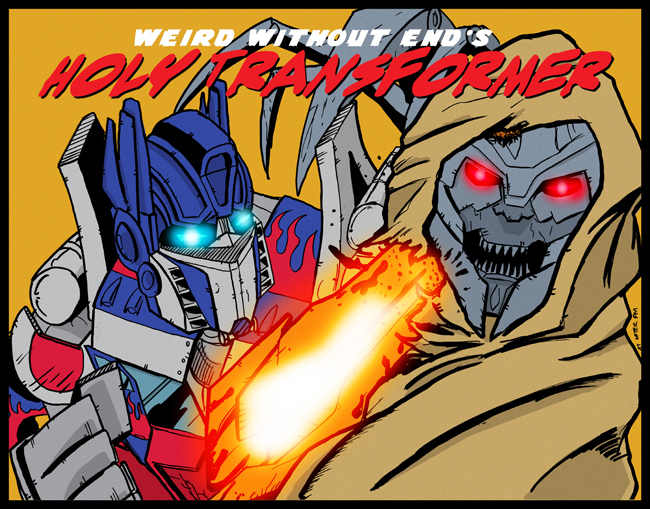 Weird Without End’s Holy Transformer – On Sale Now! 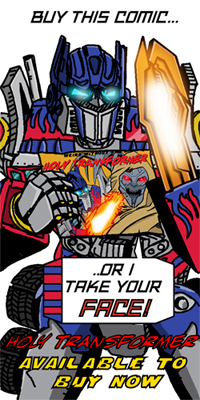 A few websites ago, I had a go at parodying the Michael Bay live action Transformers films. Specifically – Revenge of the Fallen. Difficult enough given how much of a joke the films actually were. I have collected the strips together in a shiny print edition, with a couple of bonus strips that are exclusive to the print edition wrapped in a shiny cardstock cover aping the cover of a certain controversial comic collection from Frank Miller. It’s available to buy now for the princely sum of £2.75 from Lulu.com. For fans of some more current work, I’ll be collecting the Daily Straxus strips later on in 2013.